Obituary for Julianne (Cable) Grieves | Cromes-Edwards Funeral Home & Crematory, Inc.
JULIANNE GRIEVES, age 83 of Sidney, passed away Saturday, October 13, 2018 at 7:52 PM at Wilson Health. She was born on September 27, 1935 in Sidney, Ohio, the daughter of the late Richard and Catherine (Mees) Cable. On November 20, 1954 Julie married Frederick R. Grieves who survives along with their three children, Rev. Charla Mayne Grieves of Botkins, Brent (Scarlett) Grieves, and Cheryl (Chris) Gallimore both of Sidney, one sister, Emma Lou Lyons of Urbana, four grandchildren, Hillary and Corinne Grieves, Cameron and Caroline Gallimore, and one great-grandson. 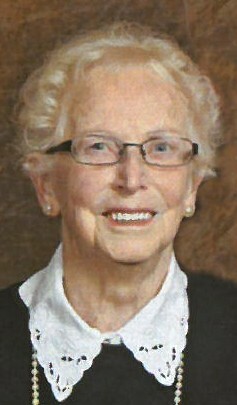 Mrs. Grieves was a 1953 graduate of Sidney High School and a graduate of Miami Jacobs College of Business. She retired in 1997 from Copeland Corporation in the International Department after 27 years of service. Julie was a member of St. Paul's United Church of Christ. She was a loving wife, mother and grandmother, was a hard worker, and loved the Lord. A Memorial Service will be held Wednesday, October 17, 2018 at 5:00 PM at Cromes-Edwards Funeral Home, 302 S. Main Ave, with Pastor Jim Oates officiating. The family will receive friends on Wednesday from 3 PM until the hour of service.